At Foster Lumber we offer a full line of building materials including lumber, hardwood and molding, nails and fasteners, roofing, sheetrock, plywood, paneling and concrete wire and rebar. We have experienced salesmen to provide accurate quotes and the materials best suited for your project. 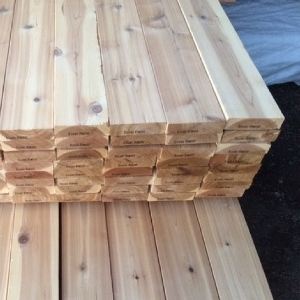 Foster Lumber yard stocks a full range of wood products for all of your consumer and industrial needs. We have a many different species of wood and various sized pieces to fit your needs. Stop in today! We carry a large line of interior and exterior doors ranging from very traditional doors to more unique architectural styles. Whether you need a patio door or a front door we have just what you need. Our expert staff can assist you with any questions you might have or help you decide which door is perfect for your home. Whether you are ready for window installation or just looking for clear answers, we can help. We welcome you to either visit us or call to see what is available. We will be happy answer any questions and start on your next project. Foster Lumber works closely with you to get your house or room the color you want. We offer many different paints as well as any tools you will need to make painting possible; from brushes to paint thinner. We have floor and counter top covers to protect your home while making your transformation and many other products to help you with your projects.